Charting the counterculture from its hippie beatification in the ’60s, the authors demonstrate how both it and succeeding variations, however punkish or nerdish, have been routinely subsumed into the consumer-fueled machinery of American capitalism. Heath (Philosophy/Univ. of Toronto) and Potter (Philosophy/Trent Univ.) will allow the phrase “co-opted” for those who insist on remaining angry about it, but really, they cajole, the hippie ethos was always destined to live on primarily in mainstream merchandising. Extremist positions like not trusting anybody over 30 or declaring that all the subtle rules that make social behavior possible and smooth personal interactions are part of a conspiracy of oppression had no permanent grip, nor should they have. 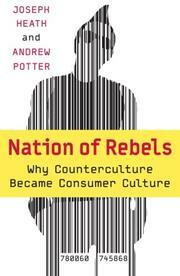 Unlike Peter C. Whybrow, whose American Mania (p. 998) finds rabid consumer greed the function of a unique “migrant” brain chemistry, Heath/Potter identify a compulsion for nonconformity as a still-ongoing phobic response to Nazism and the Holocaust; thus, it’s the constant need to make one’s nonconformity identifiable to others through the purchase of brand goods and services—an entire lifestyle—that charges the engine of consumption. The technical genius of capitalism adapts to accommodate the need—for example, by now building several different kinds of cars on the same assembly line—while at the same time taking the steam out of typical counterculture rants against “mass marketing.” That being said, the authors find a major transition in the American continuum, with the concept of “coolness” replacing what used to be called status-seeking; taken to extremes, the impulse finds people wanting to work in cool places like Palo Alto, Seattle, Minneapolis, or Austin rather than at particular jobs. There’s also much quippy commentary on things like the constantly revolving star system: “Pavarotti can’t be any good any more because too many people like him,” etc. In all, an intriguing examination of personal freedom within the inevitabilities of a market economy.